It commands the stage picture, positioned firmly downstage center where you can't miss it—an iron-filigree, treadle-propelled Singer sewing machine of the sort nowadays most often found in rural attics, disabled and rusted-out, useful only as a trellis for climbing house plants. Not this one, however! No, this vintage homemaker's helper gleams as temptingly as when first sent forth from its factory, probably sometime between 1877 and 1920. Even more astonishing, its current owner—Esther Mills, the heroine of Lynn Nottage's Intimate Apparel—actually sews on it during the course of the play. On what time-traveling device did Eclipse Theatre book passage in order to acquire this marvel of gilded-age technology? "These appliances are surprisingly durable and well-constructed," observes producer Kevin Scott, "The scrap metal drives during World War II might have posed a temporary threat of extinction, but household sewing machines were obviously highly valued." Rachel Lambert, in her capacity as the production's costume designer, is the official custodian of the eBay purchase. "The woman who sold it had been using it, herself, until just a few years ago. The belt was broken when we brought it home, but otherwise it was completely functional. We were able to locate a replacement, but then had to do additional research to learn how to install it. After some problems finding the correct tension for the belt, the only maintenance required now is to tighten it occasionally." Did anybody in the company know how to operate this antique? Lambert smiles sheepishly, "That was something we had to teach ourselves!" 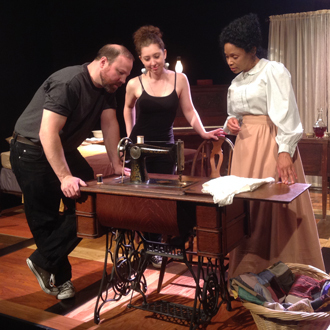 Kelly Owens, who plays the seamstress that we see toiling at the machine, admits, "The hardest part is the treadle. It's small, but heavy, and when you're wearing a corset, boots, and long skirts with multiple petticoats, it can be cumbersome." Lambert concurs, "What makes the sewing business easier is [scenic designer] Kevin Hagan's clever gadgetry allowing Kelly to sew without actually using any fabric, so she can concentrate on working the machine." This furniture's pride of place is no coincidence, declares Hagan, "The sewing machine is a constant visual reminder of where Esther's life has been focused up to the start of our story. It's noteworthy that only two other characters in the play have personally seen Esther at her trade, creating her 'intimate' apparel for her customers. The sewing machine is not just a prop, therefore, but a symbol permitting the audience a glimpse of her subconscious universe." Intimate Apparel runs at the Athenaeum through August 24.